Strange as it may sounds, this is actually a proper dish. In fact, it is one of the most popular and well loved Tze Char (煮炒) stall dishes in Singapore. The combination of the breakfast cereal and savoury prawns may well be an unusual pairing but as anyone who had ever been to Singapore or had the great fortune of trying this dish will be able to tell you, this is absolutely Shiok (or delicious in Singapore-English)! Butter, instead of the usual cooking oil are used here to impart a sweet, creamy fragrant to the prawn dish. 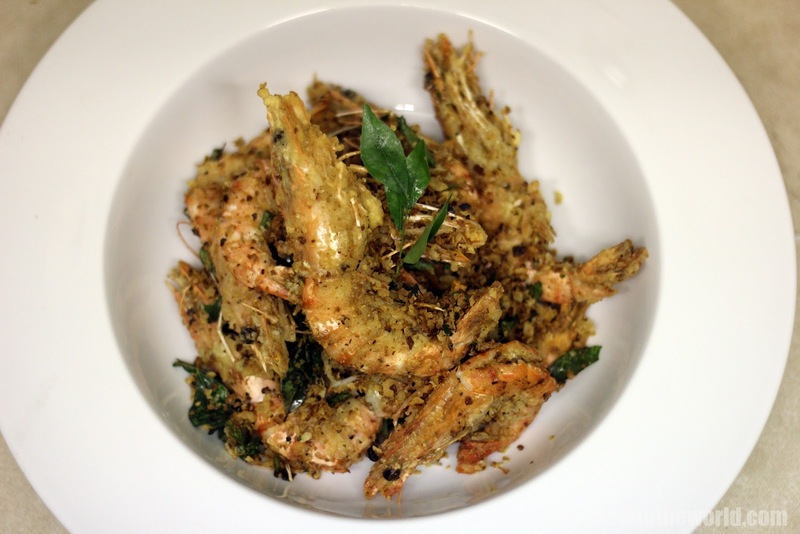 The curry leaves provides an addend aromatic touch and the deep-frying process coat the shellfish with a contrasting crunchiness that goes beautifully with the breakfast cereal. If you are tempted into trying your hand in this delectable dish, do not confuse the cereal mentioned with the normal porridge oats that you find over here. The cereal oats in question is altogether a very differently thing. First of all, this is a very particular brand of cereal to use, Nestum. The very mention of this brand to any Singaporean will almost be certain to transport them back to their childhood days when our mum would made a nutritious and healthy instant cereal drink with this and a bit of milk. It's slightly sweet and has a thinner and flakier texture compare to the usual porridge oats, thus yield a better and lighter finished results as opposed to a stodgier feel to the cereal prawns. However, it might be rather tricky to track it down outside Singapore but I did managed to procure it in a recent trip to Chinatown here in London. Try locating it if possible but whatever you do, do not substitute it with the normal porridge oats, I have and I would never use it with this dish ever again and certainly do not advise you to do so either. 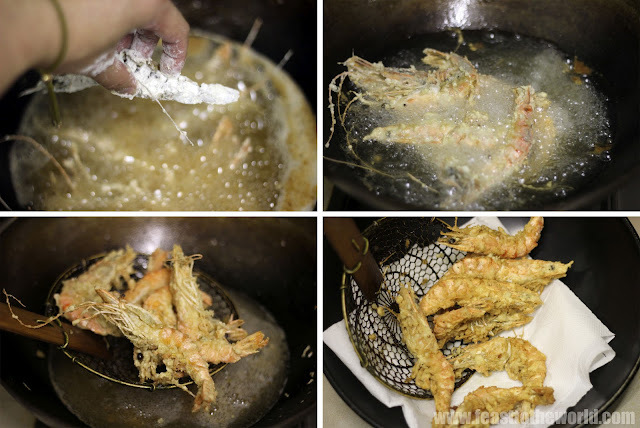 Clean the prawns, de-vein the prawns and keep the shell on for presentation. Feel free to remove the heads and shells if you wish, to make it easier to eat later. In a large bowl, mix the flour with the milk powder. Add the prawns and toss to coat thoroughly. Heat the oil in a large pan until a piece of bread sizzles and turn golden brown in 30 seconds. 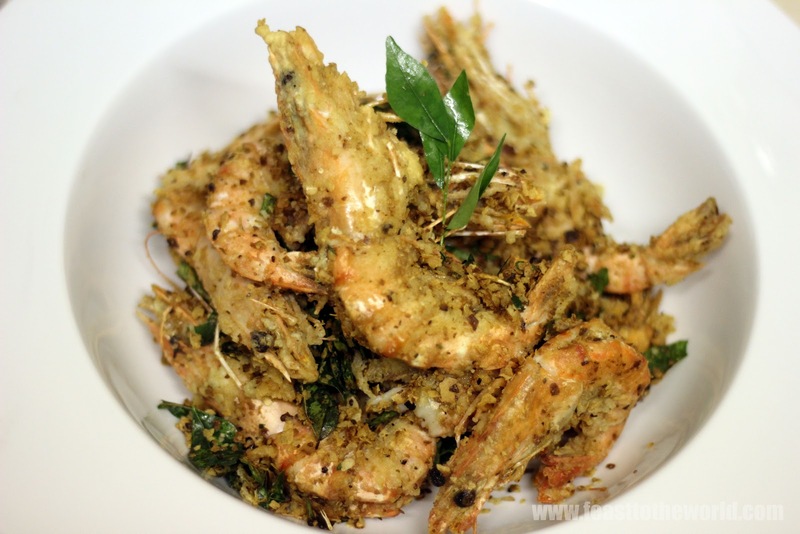 Deep-fry the prawns in batches till cooked and golden brown. Remove and drain in kitchen paper and keep warm in a low heat oven. Heat up a wok over medium heat. 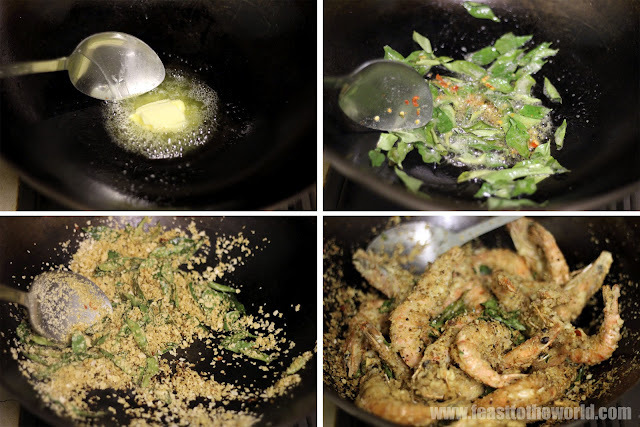 Add the butter and fry the curry leaves for a minute, untill fragrant. Add the chilli and then the cereal. Reduce the heat and stir-fry for 2 minutes, the cereal should be lightly golden brown and have absorb most of the butter. Add the prawns and toss to mix thoroughly. Season with sugar, salt and pepper to taste . Serve immediately. Wow - these sound pretty interesting. I've never had them before but I do remember that drink - a must-try. It is quite unusual but it is very commonly available in Singapore and definitely a firm favourite of mine. This looks very very delicious. It's funny that you mention Nestum as a childhood staple in Singapore, it is the same for Portugal (if I'm not mistaken the same for the European southern regions too). If you have trouble find Nestum on Chinatown I'm sure if you know of a Portuguese shop you will find it there. Thanks! That a good tip to know. I'm surprised at the popularity of Nestum. Always though it's just a South-East Asian thing. I love them as a child. I see in the picture that the Nestum cereal flakes have a flavour I'm not sure seeing in Portugal. Would the Honey or Maria Cookie ones work here? As long as they are instant cereal flakes they should be fine but I wouldn't used any flavoured ones. This dish was devised using the Nestle back in Singapore as they are light and crisp up very quickly hence giving the prawns that 'crunch', any normal cereal would be too thick and turn mushy which is not really what you are after here.